The Serbian striker will cost the Catalan side €60 million according to the reports in Catalunya. The Eintracht Frankfurt striker has been on the radar for Barcelona for quite sometime and it is very much expected that he will wear the famous Blaugrana shirt from the next season. 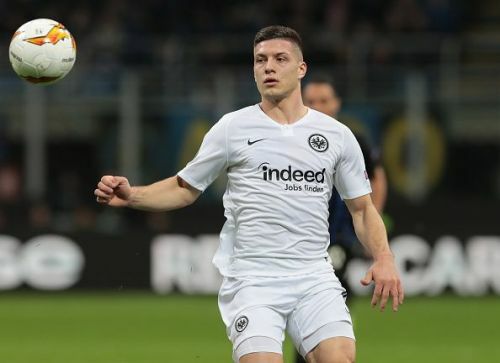 Luka Jović is having a stellar of a season for Eintracht Frankfurt. He has already scored 22 goals and also provided six assists for the German club in just 38 appearances this season. His ability to lead the forward line and play off the shoulder of the last defender is a great asset to have at such a young age. He is also excellent at build-up play and his playing style also involves a lot of layoffs, which suggests that he has got that 'Barcelona DNA' in himself. Jović fits the profile of the type of striker Barcelona wants, a young bright talent who can coexist with Luis Suárez and learn from the master himself, about how to play the Barcelona style of football. Jović might be a perfect replacement of ageing Uruguayan in Barcelona and there is no secret that the Catalan side have been monitoring his movements for quite a while now. Recently Barcelona sporting director team, comprising of Eric Abidal, Pep Segura and Ramon Planes all went to Milan to see his performance in the Europa League tie and also to discuss the prospect of a probable move to the Camp Nou. According to Catalan radio station RAC1 (via AS), negotiations with the on-loan Benfica striker is in progress and he might cost Barcelona around €60 million in the summer transfer window. In recent reports, it has been well documented that several meetings have been arranged between the Barcelona board and the player’s agent, Fali Ramadani. Rac1 is a second-tier trustable source in Catalunya which suggest that a potential move might be on the cards for this extraordinary young talent. It will be fascinating to see whether Barcelona will play the waiting game, or they will act fast considering the amount of interest there is from other European heavyweights for the on-loan Benfica striker. Frankfurt have also a purchase option in the contract, which they might active before selling to Barcelona.